This is a sake made with only water, rice, koji, yeast, and lactobacillus culture. It is in a way a brew similar to beer produced under the strictures of Reinheitsgebot, the German purity law. Traditionally, pure rice sake, Junmai-shu, has been made with rice that has had as much as half of its grain surface milled away. This process removes, in addition to the husk, much of the protein and fatty acids in the grain, which can contribute undesirable flavors to the finished beverage. However, since about 2005 a specialty sake has emerged, known as Teiseihaku-shu. This style is made with rice that typically retains about 80% of its volume, producing a drink that presents more of the charateristic rice flavor. As the proportion of amino acids rises, the result is an increase in aminosan-do, the taste of umami or savoriness. The example here is made from the short-grain rice variety Kokuho Rose, from California. This premium rice is mist-polished to remove bran dust, and is well-known for making excellent sushi. Steamed in the manner required for sake making, it comes out firm and tender without excessive stickiness. The addition of a lacto culture means that the brewer need not wait weeks for a natural souring process to take place in the moto starter, with the potential for infection by unwanted organisms. 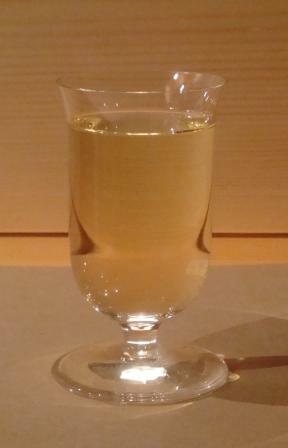 The photo here shows the sake in a clear state, but it is actually nigorizake, that is, unfiltered. The cloudy grain particles have settled to the bottom of the bottle, but can be shaken up into suspension to provide the additional flavor and characteristic look of the style. As the clear presentation shows, this sake is slightly golden in color, a result of it having been aged for two years at cellar temperature. Finally, this is a Jizake, or microbrewed sake. Obviously, because there are only six bottles in existence, it is among the most micro of the microbrews. Warning though, homebrewing sake is illegal in Japan, so if you’re there, take advantage of your proximity to those out-in-the-boonies sake microbreweries instead. This entry was posted in Uncategorized and tagged beer, fermentation, homebrewing, jizake, junmai, koji, sake, umami. I think there is a shot for lactobacillus .